Pack of 6 Assorted Plastic Screw top Waters. 2 of each. Keep your plants watered and do your bit for the environment by recycling those Plastic Soft Drink Bottles. 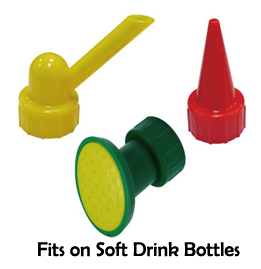 Fits on bottles from 600ml to 2 litre plus many other drink bottles that you would normally just throw in the recycle bin. Handy for herbicides or fertilizers too. Ideal for indoor plants or seedlings.